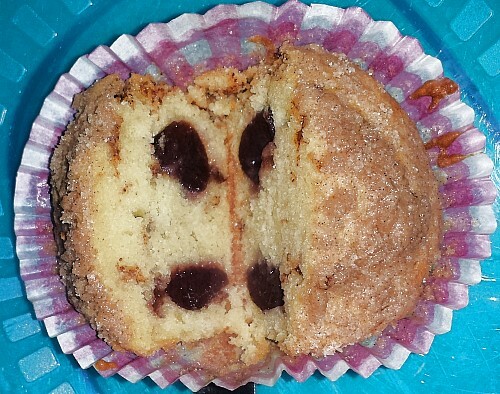 My Cinnamon and Black Cherry muffins are well known in this part of the world. I have taken them to my workplace(s), where my parents work, and to family and friends. 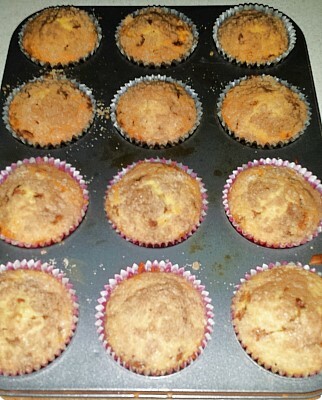 People really lose their shiznit over these muffins, they act like I am some kind of baking genius. 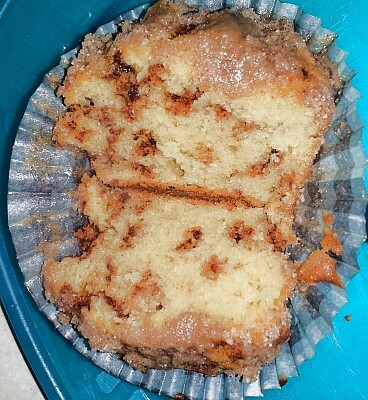 I suspect it is the Streusel topping, which, in reality, is just cinnamon and sugar. The eggs were fresh from my girls – we have a broody at the moment who is keeping them warm from when they are laid to when I collect them. You will notice the mix is a strong shade of yellow – the yolks of our eggs are such an amazing colour! Plus, there is a lot more yolk than white with our girls. You can use coconut oil for this recipe as well, though it will work best if you warm the coconut oil to a liquid state. 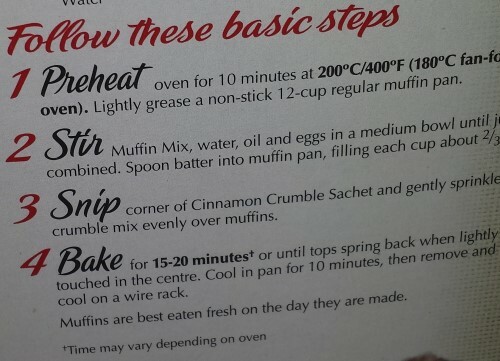 So you just put a tablespoon of the mix into each muffin pan. 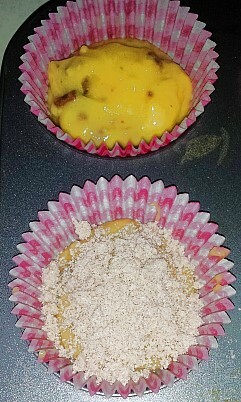 If you like, you can special up these muffins with various fruits, if you so desire. My Mother makes this packet mix too, only she adds slices of apple from a tin. You could use any kind of fruit you so desire – the back of the packet has a banana and raspberry version. Me personally, I do not like raspberry unless it is a strained coulis – I’m not a big fan of the seeds, sadly. 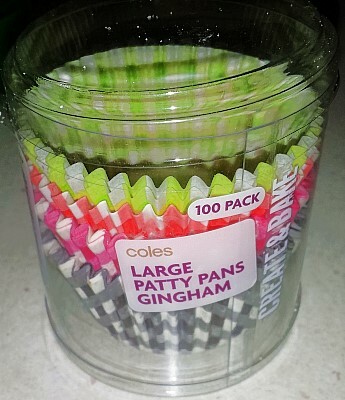 I like cherries in mine but the other half likes his plain, so using these gorgeous gingham patty pans, I can easily know which ones have cherries. Pink for mine, Black for The Other Half. Before this recipe, I would put a tin of cherries in the fridge until they were icy cold, and have just cherries and icecream. Cherries are the perfect fruit addition to this recipe. You could also use fresh cherries, strawberries, blueberries, well, just about any fruit you like! 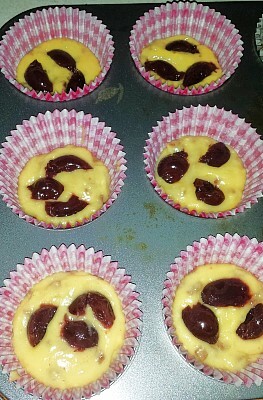 Into the pans that will have cherries, you add 2-3 pieces of chopped cherry. I like to cut mine in half and make sure there are no pits left inside – one too many pit accidents. But if you like, you can leave them whole. 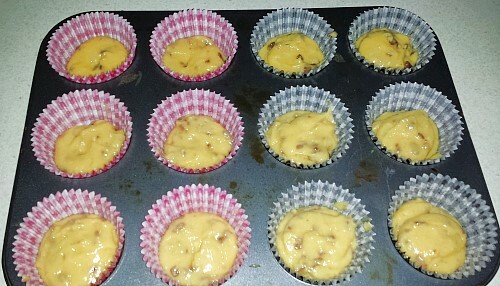 Then you add a little more muffin mix to cover the cherries, and then the streusel topping which is provided in a separate packet to the muffin mix. 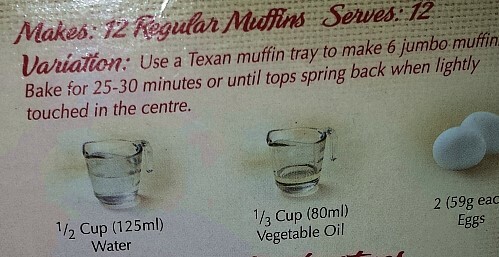 And then you bake them for a bit, following the instructions on the pack. Now, if you are like me, you’ll bake these after dinner, and make them into an awesome dessert, by cutting them in half while still hot, popping them into a bowl, and adding icecream. So awesome! Now, onto the Iced Tea. 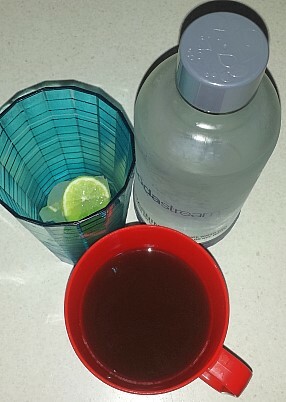 I have never made this before but I am always willing to try new flavours to go with my soda water. I used the Australian Afternoon Tea by Twinings which is one of my personal favourites. 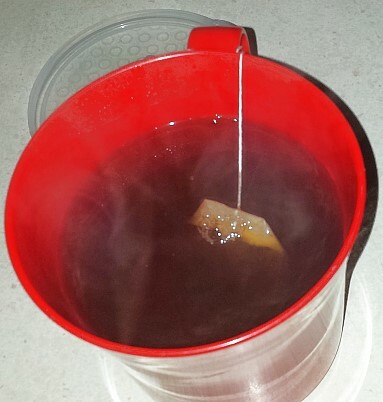 Simply brew up a cup of tea the way you usually would, with boiling water. To provide a little sweetness, I added honey while brewing the tea. You can use any sweetener that you prefer – coconut sugar would be my second choice, and I will give that a try as well because it will provide a more caramel flavour as opposed to the honey flavour. Place the brewed tea into the freezer for a while. 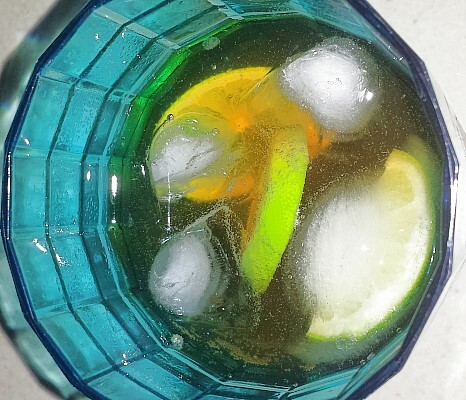 I left mine in for a few hours, then added freshly charged via Sodastream soda water, ice and slices of lime. It was absolutely delicious. Full of flavour, and low in sugar. If you like Nestea or iced tea, you absolutely should give this a try. 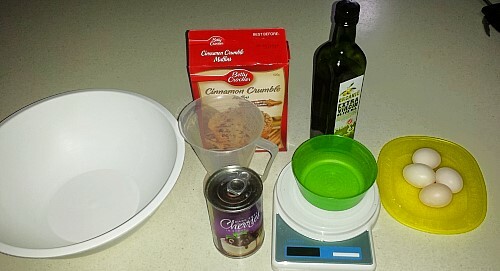 This post was inspired by two other posts – Fake it ’til you bake it over at Awesomely Unprepared, and How much sugar is in that? at Laughing Galah. I have a couple of Betty Crocker chocolate cake mixes in my pantry, plus a jar of black cherry jam. 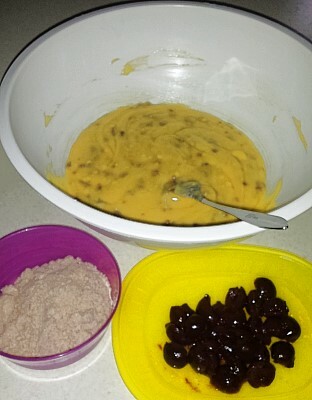 These will eventually become Black Forest cakes. When I’m in the mood.